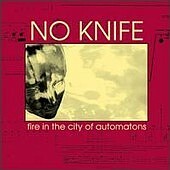 No Knife's latest, Fire in the City of Automatons, is eerie and beautiful at the same time. It revolves around slow, heavy guitars that bounce off of each other and mid tempo drumbeats that help the song simmer in its own juices. But as slow and steamy as the album is, it also has its rock pulse beating. The guitars come alive, choosing to burn holes in the song rather than rest and lament. Beautiful pop melodies sit next to caged rock rage, before splitting off into soft, intricate moments of transparency and clarity. I'll give this album a B. No Knife: ...Hit Man Dreams... No Knife: Riot For Romance!